Firstly to save costs. Refilling laser cartridges can save you a lot of money. At the moment it costs more than R1100 to purchase a Canon 725 cartridge online, whilst a refill would cost you R270 at CTEC. This is only one of the many examples of how you can save money on toner cartridge refills in Bloemfontein. It is a fact that refilling compatible printer cartridges can save more than 75% as compared to buying brand new OEM cartridges. To save the environment. You can read our recycle page to find out how many empty cartridges land up on landfills and create a bio hazard for society. Printer cartridges are made of plastic and you are contributing to the bio hazard problem by throwing it away with the rest of your garbage. CTEC is actively trying to make a difference when it comes to saving the environment by safely recycling empty cartridges and safely disposing of unusable cartridges. At CTEC we are a ISO 14001:2004 accredited firm and we adhere to all the standards that are set. You can definitely also make a difference by refilling your cartridge. Why use CTEC to Refill your Used Cartridge? Toner cartridges cannot be refilled indefinitely. Unfortunately there are movable parts inside the toner that wear out over time and need to be replaced. The drum can be scratched or depleted and rollers and wiper blades need to be replaced. CTEC has a proven record when it comes to toner and ink refills and we are one of the leaders in this field. 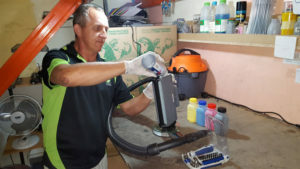 There are many dealers out there that offer toner cartridge refill services that is done by simply drilling a hole into the toner cartridge and refilling it with substandard toner. That is why they also charge cheaply. These dealers usually also have a lot of comebacks and generally they give the toner refill business a bad name. At CTEC we thoroughly check that the parts of the cartridge are still in working order, before refilling the cartridge with quality toner. We also replace chips where needed, so that you won’t have problems with your printer not recognizing the refilled toner cartridge. Insufficient lubricant in the toner, leading to drum, developer unit or cleaning blade damage. Wrong melting point, leading to fouling in the fusing unit, print rubbing off, etc. Wrong electrostatic properties or particle size, leading to a dirty machine and poor quality print. At CTEC we have the experience and know how to avoid this mistake. For a few rand more let us refill your printer cartridge and save up to 75 % on your printing. In our honest way of doing business, we will tell you when it isn’t feasible to refill your toner cartridge.